Neil Armstrong wasn’t your typical Boy Scout. While the other boys in Troop 25 out of Sandusky, Ohio, were horsing around at meetings and campouts, “Neil was buckling down to learning things like the flag semaphore code and first aid,” one of his troopmates told Scouting magazine in our March-April 1970 issue. And so when Armstrong, Michael Collins and Buzz Aldrin landed on the moon on July 20, 1969, those who knew him way back when weren’t a bit surprised. 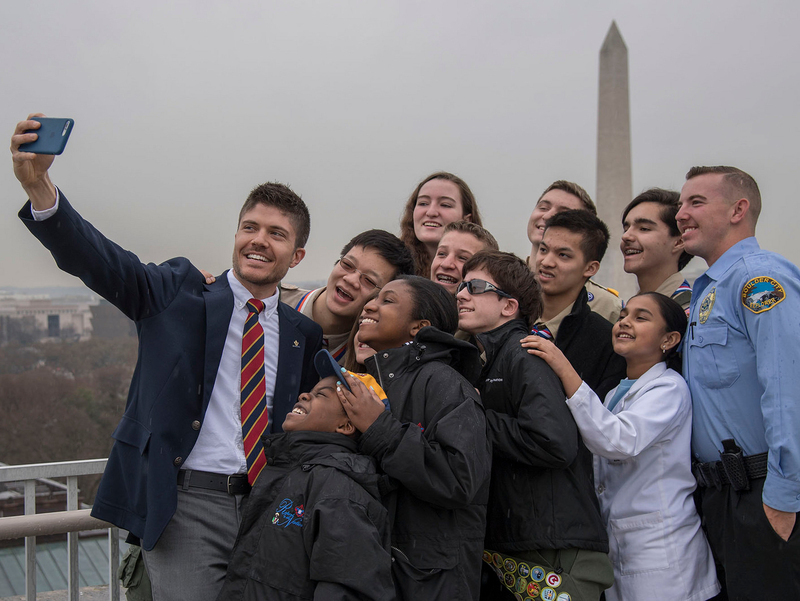 They expected this Eagle Scout to do some out-of-this-world things. Always a step ahead of his classmates, Armstrong skipped a grade in school and graduated early. At age 17, he was a freshman at Purdue University — where the Neil Armstrong Hall of Engineering now honors his legacy. Most college freshmen lose touch with Scouting until they have Scout-age children of their own. But not Armstrong. When he heard that two of his closest Scouting friends had earned Eagle, Armstrong was determined to follow suit — even though that meant juggling merit badge work and college coursework. Armstrong’s younger brother, Dean, told Scouting magazine what the moonwalker learned in his Scouting years. Scouting helping boys and girls become confident men and women? Some things never change. Neil Armstrong didn’t stop at the 21 merit badges required for Eagle. He finished with 26 — including the Scholarship, Aviation, Pathfinding and Pioneering merit badges. The Space Exploration merit badge wasn’t created until 1965 — the year Armstrong turned 35. A Scout is trustworthy, and Neil Armstrong was no exception. While hiking 20 miles for the Hiking merit badge, Armstrong checked his watch and panicked. The hike was taking longer than planned. If he didn’t hurry, he would be late for his job at the bakery — unacceptable behavior in this young Scout’s mind. “So, he took off at a Scout’s pace, alternately running and walking” and made it to work on time, his friend K.K. Solacoff told Scouting. Work was just a fact of life in the Armstrong household. Armstrong’s first job was cutting grass in the local cemetery. His pay: 25 cents an hour. A diligent student, dedicated Scout and model employee, Neil Armstrong still made time for some fun. Like the time in his high school marching band when Armstrong, who played baritone horn, turned his cap around and marched backward — upsetting the band director. Or when he built a wind tunnel for a school science project. Armstrong used stove parts, an electric motor and an old airplane propeller to build a device so powerful that it blew fuses in the house. Neil Armstrong aimed the machine up the basement stairs and sent Dean up to get their mother. Here’s the text of the Scouting story “Eagle on the Moon.” It’s a fascinating read. Love Scouting history? Get Scouting‘s app. Available for iOS, Android and Kindle Fire devices, the Scouting magazine app gives you access to the entire Scouting magazine archives. That’s every issue from 1913 to today. You can buy single issues for $3.99 apiece, but the best deal is the all-access annual pass. For just $4.99 a year, you get unlimited access to every issue of Scouting magazine ever published. Just search “Scouting mag” in your device’s app store, and get ready to step into the Scouting time machine.